NEW ORLEANS – The 2017 cross country season marches on and so do our National Athletes of the Week. 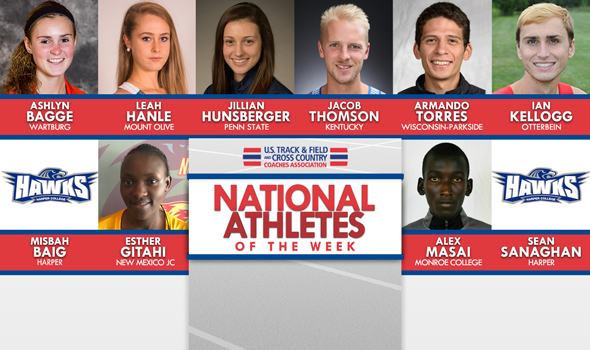 This past weekend saw some impressive action across the nation and these athletes are well-deserving. Jacob Thomson got his first taste of victory on the cross country course this past weekend. Thomson opened his senior year at Kentucky in a big way at the Bluegrass Invitational when he stormed to a victory in 23:42.1. The senior from Louisville, Kentucky ran clear of runner-up Jamaine Coleman of Eastern Kentucky, who finished 11 seconds behind. This could be a big campaign for Thomson as he hopes to qualify for the NCAA Division I Cross Country Championships which will be held in his hometown in November. Thomson qualified for each of the past two national meets as an individual and finished as high as 44th in 2015. Make it two in a row for Jillian Hunsberger. After winning the Dolan Duals two weeks ago, Hunsberger returned to the top of the podium this past weekend at the Harry Groves Spiked Shoe Invitational. Hunsberger finished in 21:07 – three seconds ahead of Syracuse’s Paige Stoner – and topped a field of 85, which included the likes of No. 11 Penn State and No. 26 Georgetown. Hunsberger earned All-America status last year in cross country and is carrying over a lot of momentum from a strong track season. She finished 10th in the 10,000-meter finals at the 2017 NCAA Division I Outdoor Track & Field Championships. UW-Parkside got a shot in the arm to open the season with Armando Torres’ performance at the Vic Godfrey Open (8K). Running on his home course, the redshirt senior out of Green Bay led the field of 167 with a finish of 25:04.3, setting a meet record in the process. Torres’ time was 10 seconds faster than any competitor and 50 seconds ahead of any other non-DI finisher. The meet featured NCAA Division I athletes from Marquette, DePaul, Wisconsin-Green Bay, as well as a slew of NCAA Division II competitors. A year after finishing 25th at the NCAA Division II Cross Country Championships last year, Leah Hanle is on a mission. The sophomore from Germany posted a third-place finish at the Furman XC Classic (6K) this past weekend with a time of 20:49.97. Her time marked a new personal and school best time, knocking off nearly half a minute from her previous best. Hanle was only bested by two runners – Allie Buchalski and Gabrielle Jennings of Furman – but managed to finish an astounding 10 seconds ahead of the meet’s fourth-place finisher. Hanle’s time put her ahead of NCAA Division I runners from Furman and Clemson, among others. Ian Kellogg made quick work of the OWU Invitational this past weekend and led Otterbein to the team title. Kellogg covered the 8K tract in 25:29.3 and was one of three Cardinals inside the top-5. The junior from Bexley, Ohio, ended up winning by more than 11 seconds. Two years ago Kellogg competed at the NCAA Division III Cross Country Championships and finished 86th and with more races like he had this past weekend, he’ll return to that meet and possibly finish a lot better than he did as a freshman. Ashlyn Bagge dominated the Les Duke Invitational this past weekend. Bagge, a senior from Independence, Iowa, rolled to a 54-second victory in the women’s race. She covered the 6K course in 21:28.2, a far cry from the runner-up’s time of 22:22.1. This was Bagge’s second win in a row as she also won two weeks ago at the Crown College Invitational. Bagge also excelled during the outdoor season as she finished in the top-8 of both the 5,000 and 10,000 at the NCAA Division III Outdoor Track & Field Championships. There’s nothing like going up against some of the top competition in the region for your first meet. Monroe College’s Alex Masai did just that, taking on competitors from NCAA Division I programs like Stony Brook, Marist and Seton Hall at the 15th Annual Wolfie Invitational (8K). Masai posted a time of 24:53.59 – breaking Monroe’s 8K program record – while being the top non-NCAA finisher at the meet. The native of Kitale, Kenya finished sixth out of 46 competitors. Esther Gitahi smoked the competition at the Texas Tech Open (5K) during her collegiate debut, finishing in first with a time of 17:32.2. With an average mile of 5:38.6, the native of Nakuru, Kenya finished 45 seconds ahead of her nearest competitor in a field that was mostly comprised of NCAA Division II and NAIA athletes. Sean Sanaghan finished fifth out of a whopping 143 runners at the 2017 Spartan Classic (8K), hosted by Aurora University. The rookie out of Mt. Prospect, Illinois notched a time of 25:58.0 to best all but four in a field that consisted mostly of NCAA DIII athletes. The Hawks posted a third-place finish as a team. Like her male counterpart, Misbah Baig of Harper College kicked off her collegiate career in grand fashion by leading the Hawks to a fourth-place finish at the 2017 Spartan Classic (6K) at Aurora University. Baig paced all NJCAA runners for a time of 23:09.5, good for eighth place.